Copper is truly a unique building material. Its positive attributes include durability, corrosion resistance and, above all, a highly desirable appearance. Due to these and other positive aspects, copper can still be found on original, renaissance-era roofs as well as in experimental, contemporary architectural designs. 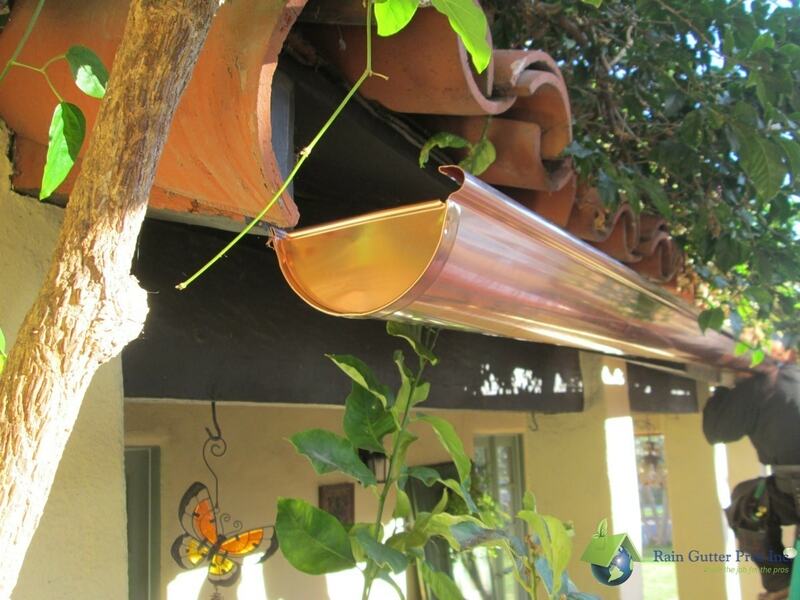 Although more expensive than more common gutter materials, Copper’s unique attributes mean that it’s hard to replicate the features of a copper gutter. Firstly, the aesthetic appearance of copper is completely unique. From its initial reflective appearance, copper quickly begins to develop a patina. After gradually shifting through several darker colors in the process of oxidation, copper will ultimately develop the greenish tint that can be seen in classic architectural features. Due to this coloring, copper is desirable to those who have a unique aesthetic vision, or are attempting to match the décor of a historical house or building. Many people who are undertaking the latter will opt for Half Round gutters, but copper gutters can be had in virtually any shape. Secondly, copper is durable and corrosion resistant. Whereas a steel gutter may be strong, even galvanized steel will begin to rust within a couple of decades. Copper gutters, on the other hand, should still last for many decades even in corrosive environments (seawater, acid rain, etc.). Finally, due to the fact that copper gutters will be soldered at the seams, they are not prone to leaks or breakages in the manner that aluminum or other gutters materials may be. For this reason and it’s longevity, copper has often been used in difficult or dangerous-to-access parts of buildings (although one still needs to clean debris from them). Considerations– If you choose copper gutters, you will need to have a professional install them, but you will nonetheless want to pay attention to what materials the copper comes into contact with, as it has the potential to corrode certain metals if it comes into contact with them. It can also, over time, stain lighter, porous materials. Furthermore, though most people are seeking the patina of copper, one should not plan their house’s décor around the initial gleaming reddish color of brand new copper. Ultimately, copper is a worthy and unique building material, but the fact that it’s one of the more expensive gutter materials makes the decision worthy of careful consideration.